A glimpse of Boise's industrial zone. 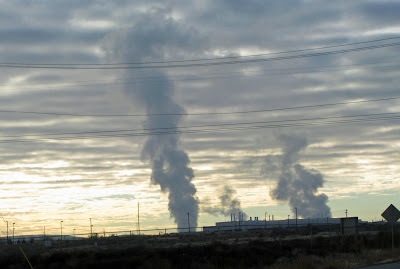 This pollution is more visible than normal because of a cold day, which meant steam, too. Thanks to my husband for catching this shot. I saw this shot on the CDP portal. It's striking. Nicely done. I thought it was a tornado in the shot..
Looks like the oil fires we saw during the first gulf war.